This is your Criquet Caddie checking back in, taking the collective temperature here on the first page of the 2018 calendar. I’ve spent these last few post-Yule weeks trying to get back into the swing of things, slowed down at every turn by some measly, small-potatoes cold. You know, the kind that you’d feel guilty calling in sick for: so, unfortunately, I haven’t even had the pleasure of a delirious NyQuil and Netflix vacation as of yet. But one can dream. Here at the Clubhouse, I’ve met my first real spiritual test of 2018: a duel of wits with our printer. It’s a hellish battle of attrition that I won’t lose because it’s 2018 and every battle I wage with a machine is now first and foremost a matter of pride. For hours I’ll sit at my desk and cast glances at the thing. I’ll mutter curses under my breath and between sips of coffee, knowing that it’s probably conspiring with the other devices in my life in occult ways that are currently beyond my knowledge. Thanks Google. I finally understand that scene in Office Space (baseball bats, field, gangster rap) profoundly. Still waiting to hear back from the Founders on whether they’ll let me recreate it in the back yard. I’ll get back to you on that. If it’s a yes, expect video evidence. Well anyway, now the short-lived comforts of roast beef, pie, time with family, and a license to drink way too much lie well behind us. But so does the awful music, I suppose. As football season winds to a close, and the Christmas trees are rotting and browning God knows where, what, exactly, are we left with? Maybe the truth that there’s nothing new under the sun, or that material things won’t save you; that time is a flat circle, or life is a slow climb toward a cold shell of a grave where you’ll be haunted by nightmares of errant printers? Sure, maybe, but you’ve been hungover before, and January is just a hangover extended over an entire month. Nothing to do but forge ahead. Go on your diet. Take your vacation. Bright things are on the horizon; some of which have already arrived, like our new resort collection of Players Shirts. 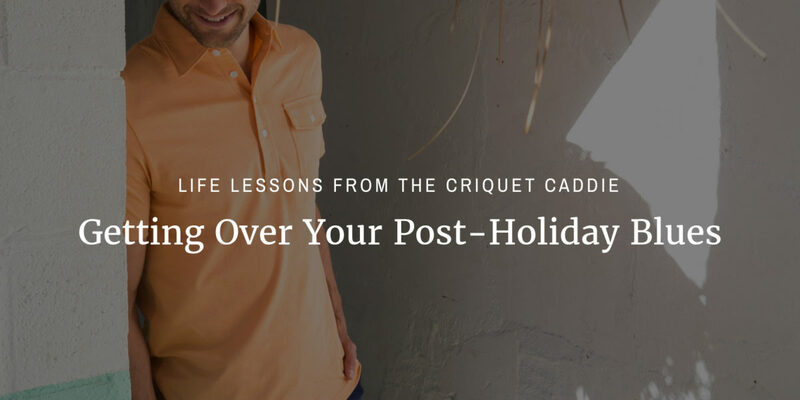 Allow these to lighten your spirits, and until the courses thaw, do what you can to recover— practice your short game, drink dark beer, meditate, and know that warmer days lie ahead. Oh, and be the ball.